Dealing with the many forms of the popular pool sanitizer. Managing the Chlorine level, of pool water!!! How to use chlorine, as a pool sanitizer? Chlorine is the most popular and cost effective pool water sanitizer. It is available in variety of chemical types including: calcium, sodium and lithium hypochlorites, and the stabilized Dichlor and TriChlor. Products are available in liquid, granular or solid forms and can be added by feeders or manual application. Which product to use will depend upon pool usage conditions, cost considerations, type of equipment, source water chemistry, type and size of the pool. Chlorine can used in another entirely different and better way: a salt chlorine generator uses ordinary salt and converts it into chlorine. This eliminates the need to handle, store or measure chlorine products. Chlorine can also be used in conjunction, with a Solar-Powered Pool Mineralizer, Solar UV Sanitizer or an Ultraviolet Sterilizer, to improve sanitizing and reduce chlorine consumption. To get the most out of chlorine, it is important to maintaining good pool water circulation and test the water on a regular basis, with a reliable tester. If problems arise, refer to the Pool Problems Page, as a source of problem-solving information, broken down into various categories. Scroll down the page and click on the linked keywords, catch phrases or images, in the archived answers below, to access additional information, on that topic or product. "Chlorine Lock" is a mythical term. All it means is that the demand, for chlorine is so high, that a large amount of chlorine is required, to establish a persistent free chlorine level and destroy the combined chlorine. This is typical at pool opening time. The salt chlorine generator, simply cannot produce enough chlorine, fast enough to catch up. Adding supplemental chlorine, as you have done, is the right thing to do. Once there is a free chlorine level and the water clears, the salt chlorine generator should be better able to maintain a suitable level. We hope that the information provided was helpful. If we were helpful, please return the favor and tell your pool or spa owning friends, about our website. ► Chlorine Feeder: Which Product? We recently moved into a house with a pool. We plan on opening the pool next month. The problem is that the previous owner left some chemicals and there are two kinds of chlorine. One is big tablets, 3 inches or so, and the other is a calcium something or other granular. The pool is equipped with a built-in feeder. I assume that the tablets should be used, but I'd like to hear it from you. Thanks. The only product that should be used in built-in feeders are the slow-dissolving TriChlor Tablets. Never, repeat never, use any other type of chlorine product in a built-in, in-line or any type of filter with an enclosed space: to do so could destroy the feeder and could present an explosive situation. The granular product sounds like calcium hypochlorite: this was probably used to shock treat the pool on a regular basis. 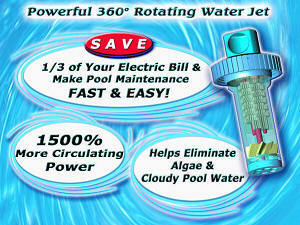 You can reduce overall chlorine usage, by 50% or more, by adding a Floating, Solar UV Sanitizer. It uses ambient or sunlight to cause a small quantity of the water molecules to form free radicals, which act in concert with chlorine to destroy organic contamination and inhibit algal and bacterial growth. Get better results, with fewer chemicals. I hope that this recommendation works out for you. ► Chlorine In A Small Pool? We have an above ground pool: 15' diameter X 4' deep. I have been told that the amount of chlorine, that a pool requires, is more dependent upon the bather usage that it is upon the actual gallons. Is that true and what do you suggest? Thanks. It is true that the amount of bather wastes is not just dependent upon pool size. A small above ground pool will require less chlorine than a big inground pool. The chlorine requirements, of a pool, are not strictly based upon the water volume. Actual pool usage must be fac tored into the maintenance procedures. Smaller pools can be depleted of chlorine more quickly than larger pools, if the bather usage is similar. In order to maintain a more uniform chlorine level, a chlorine feeder is a worthwhile consideration. Smaller pools can get by with a floating feeder, although there is a risk of vinyl liner damage, if the floating chlorinator remains in prolonged contact with the pool walls. An inline chlorinator is always a better choice. To regulate the amount of chlorine, it is important to test for Free Chlorine on a daily basis and even more often during periods of high bather usage. In addition, it may be necessary to supplement a chlorinator with periodic additions of a quick dissolving chlorine or shock, during or after periods of high bather demand. In short, small pools do require more diligent attention, if problems are to be avoided. 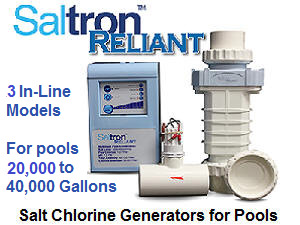 New and affordably priced ways to chlorinate a pool include the Reliant Salt Chlorine Generators, Model SR Salt Chlorine Generator or MegaChlor Salt Chlorine Generator. They works well in most above ground pools, installation is minimally simple and no plumbing is required. It can make all the chlorine your pool requires, without handling or storing chlorine. I hope that I have been of assistance. A salt chlorinator is as a reliable a sanitizing method as any other form of chlorine. The big difference is that it avoids a lot of the chemicals and makes the overall pool water chemistry easier to maintain. So far as the economics are concerned, I really don't have all the information necessary to make that determination. However, I would suspect that there is not a major difference over time, but the convenience factor is significant. My long-term, personal experience was very satisfactory and I know the product category has been improved over the years. I hope that I have been helpful. ► What To Use In An Indoor Pool? What's the best sanitizer to use in an indoor pool (with little to no sunlight) with the use of an inline chlorinator? Will Cal hypo dissolve too rapidly in a chlorinator? Thanks in advance for your help. Glad that you asked which product would be best. The one you are considering would be absolutely the worst. You cannot use calcium hypochlorite in any enclosed inline feeder, as it will dissolve too rapidly and can result in an explosion. If you want to use the inline feeder, the only chlorine product that you should use are trichlor tablets. The absence of Sunlight has nothing to do with this decision. Being that the pool is indoors, there are better choices for sanitizing. Bromine can be used with a bromine feeder and will produce less odor than chlorine. Better yet would be a salt chlorine generator. It is highly controllable and reduces the chloramine odor that is sometimes associated with chlorine, by destroying these odorous byproducts, as water passes through the salt-cell. I hope that I have been helpful. I have just taken over the running of a Hydrotherapy pool in London for a hospital. The sanitiser they have always used here is sodium dichloroisocyanurate. I have read recently that this is not suitable for shock dosing as it is a weak oxidising agent or suitable for use in indoor pools. The pool is indoor, with a glass roof. We have to run it at 35 degrees centigrade to be warm enough for our patients. I'm not convinced we need to use a stabilised chlorine with the pool being indoors. Our water supply is pH 7.7. We have sand filters. Dichlor granules are mixed into a solution and dosed via automatic dosing system. The pH minus we use is sodium bisulphate, dosed in the same way. We shock regularly as our patients are incontinent plus we have had issues with pseudomonas. In other pools, I've always used calcium hypochlorite, but never had a water supply with such a high pH. Our Langelier index usually shows a balance of 0.3, so not too bad! What would you recommend that we use? Bear in mind, we would not be able to change any of the plant/dosing equipment. Kind Regards. Sodium dichlor is not a weak oxidizer! It is every bit as strong as other chlorine products. The difference may be in the concentration. It is not necessary to use a stabilized chlorine in an indoor pool, as the stabilizer plays no role. Sodium dichlor has the advantage of being co mpletely soluble and essential pH neutral. Calcium hypochlorite on the other hand is not completely soluble and contributes calcium hardness to the water, which will cause the Langelier Index to rise over time. As the stabilizer level builds up over time, it may be necessary to replace some of the water. Given the type of pool and it use, that would not be a bad practice. Given the choice of calcium hypochlorite or sodium dichlor, I would choose the latter. However, there are better choices to consider, if not for the immediate time, then for the future. I would give some serious thought to a salt chlorine generator and or an ozone generator. Another excellent choice would be chlorine or bromine and an ultraviolet sanitizer. This will allow you to maintain a satisfactory chlorine or bromine level and cut chemical usage by as much as 85%. In addition, ultraviolet can kill microorganisms that might have built up some resistance to chlorine or bromine. You'll have less odor and more control. I hope that I have been helpful. ► Testing Free and Total Chlorine? I just purchased a ColorQ 2057, test tabs model, from your store, and have a question about testing for chlorine levels. The test unit has two tests one called "free chlorine" and the other "total chlorine". I am currently testing for "free chlorine", DPD1 tablet, because it is easy to test . However, if I want to test for "total chlorine" I have to loop through all the tests and insert the DPD3 tablet. The levels seem to double by the time I loop around. What test should I use? If "total chlorine" is what I should be testing for, should I just insert both tablets to perform the test? Should the levels change or be more stable? Thanks in advance for your help. Each test has its purpose, with free chlorine being more important, in most cases. Free chlorine measures the active, germicidal form of chlorine, which is virtually odorless. 1.5-3 PPM is considered ideal. Total Chlorine is Free Chlorine plus Combined Chlorine. Combined Chlorine is odorous, irritating an largely ineffective, as a sanitizer. To measure Combined Chlorine, you subtract the free for the total. The goal is as little combined chlorine, as possible. Under 0.3 PPM is great. Under 1.0 PPM is marginal and odor might be noticeable. Higher levels are odorous and potentially irritating. Combined chlorine (chloramines) forms when free chlorine treats with nitrogenous wastes, such as sweat or urine. High combined chlorine level require treatment. Oddly enough, the treatment is to add more chlorine or non-chlorine shock. To destroy 1 PPM of Combined Chlorine will require the addition of 10 PPM of Free chlorine. The free chlorine destroys the chloramines and nitrogen gasses off. This illustrates why urine in a pool can be such a problem. I suggest that you run both tests daily, to get a feel. Thereafter, run the total chlorine less often or at first signs of a loss of water quality or signs of odor. When you think you are smelling chlorine, it is actually chloramines that you are smelling. It takes 30 PPM of chlorine to create a smell, but only 0.1 PPM of chloramines. The ColorQ All-Digital Analyzers are small enough to hold in the palm of your hand, but are big in capability. No color-matching and no guesswork. I hope that this clears the air and thank you for the purchase. ► A New Paint Job And Chlorine Choice? Ultra Poly One Coat is a hybrid-epoxy coating and is quite resistant to chemicals and chlorine should be no problem. Looking past the hype, chlorine is chlorine, but there are differences in how uniformly tablets will dissolve, as an example. There is a better way to do chlorine. A salt chlorine generator! It is chlorine without all the negatives. No chlorine odor, no handling, storage or buying chlorine and much better water quality. You'll have to buy some salt - common, non-iodized food grade or water softener grade - inexpensive! Thereafter, you need to add more salt only to replace that lost through pump out, splash out, backwashing or overflow. With a salt chlorine generator, all you need to do is add an initial dose to stabilizer to bring the level up to 40-60 PPM. Thereafter, more stabilizer is needed only to replace that lost through pump outs, backwashing and splash out. The overall water chemistry should be maintained in the usual manner. Because salt chlorinators destroy chloramines so effectively, you will find the swimming conditions more pleasant and easier to maintain. Proper salt level is important. Too little and not enough chlorine will be produced. Too much could shorten the life of the salt cell. PockeTesters are the easy way to test the salt level. I hope that you will find this information helpful and thank you for the on-line purchase of the Ultra Poly One Coat. I just opened my above ground pool (18' X 4'). I added chlorine stabilizer and liquid chlorine. I actually put in about 2-1/2 gallons of liquid chlorine and still can't get a reading on my test strip. It is reading the chlorine reading very low. Does liquid chlorine expire over time? I bought several cases last year when I found a good sale, but there is no expiration date on the bottles or boxes. Thanks. Most liquid chlorine is labeled at a strength that is probably lower than actual, in order to allow for loss during storage. I doubt that the problem is the chlorine. Instances of sub-potent product are rare. It is not unusual for a just opened pool to require a lot of chlorine. I suggest that you bring in a water sample for testing. This will confirm your own test readings and uncover any other water chemistry problems. Most likely you will have to add more liquid chlorine, until you are able to maintain a 1.5-3 PPM level of Free Chlorine for an overnight period. This is necessary in order to destroy all of the accumulations, that have occurred since the pool was closed. Keep adding shock, as needed, until this is achieved. The presence of phosphates and nitrates can accelerate algae growth and increase the chlorine demand. Some dealers can perform these tests and it can be worthwhile. If phosphates or nitrates are found, POOL REFRESH is a convenient, 2-part way to solve the problem. I hope that this information will prove helpful. Hi Alan: I have a small inground pool and it holds about 10,000 gallons of water. I have been putting in 2 x 3 inch tablets a week and one 2 1/2 gallon jug of liquid chlorine. I am getting older now and having a hard time with the jugs as they are getting to heavy for me. Is there anything that I could replace the liquid chlorine with once a week that may be easier? I bought some small packages of super chlorinate granules and it says for 10,000 gallons of water. Would that do the trick? Thanks a lot. Basically, you were supplementing the chlorine tablets with a once-a-week shock treatment using the liquid chlorine. You can use a granular chlorine or shock for the same purpose. The tablets have a low pH and the liquid chlorine has a high pH. They tended to cancel each other out. Switching to another product might require that you pay more attention to the pH, depending upon the nature of the product. An easier solution would be the addition of a Floating, Solar UV Sanitizer, which creates free radicals, that act in concert with chlorine. This eliminates organic wastes, odorous chloramines, while cutting chlorine usage by 50% or more. I hope that I have been helpful. Enjoy the pool season. This is incredible! Four pounds of shock, plus another pound of granular chlorine, plus 3 gallons of liquid chlorine, added to almost 20,000 gallons of water and no chlorine readings at all. This is a first for me. I even took one of the test strips and put it into some straight bleach to see if it was any good. It turned instantly dark purple. So I know they're working ok. Is this the first time you have heard of this happening? NO!!! A woman once told me that she had added 36 pounds of shock, over time, and I told her it was not enough. It will be enough only when you have a stable free chlorine reading. Have your water tested for phosphates and nitrates. These minerals can add to the chlorine demand by accelerating algae growth. You can't do anything about the nitrates, but you can deal with the phosphates. Removal of phosphates will make nitrates less of a problem. For free chlorine testing, I suggest using LaMotte Insta-Test strips, as they provide the right kind of information. To better assure proper overall pool water chemistry, visit a pool store that has a very reliable, professional lab such as a WaterLink SpinTouch Lab, rather than a less accurate test kit or strip reader. I hope that I have been helpful. How long might it take for a free chlorine level of 15 to drop in a 18,000 gallon pool when it is still cool and little sunlight? I superchlorinated when I opened my pool due to green algae and now the chlorine level is 15 ppm and not coming down. My pool is still very cloudy. Any suggestions? It is not likely that the test kit could have measured a reading as high as 15 PPM with any reliability. The true reading could have been even higher. That fact that water is still cloudy, could indicate that the chlorine still has some more work to do. I suggest that you add a dose of a "Blue" Clarifier and give it a little more time. A Nano-Stick Clarifier is an effective way to provide clarifying action, without adding more chemicals, for up to 6-months. The Nano-Technology is a new breakthrough and works well with all sanitizers. If the water clears up and there is still a very high Free Chlorine level, it is possible to add a chemical that will quickly lower the level. But, first get the pool water clear. Many pool professionals carry a chlorine neutralizer product, for use in case of severe overdosing. Time is on your side. Refer to the archives on cloudy water and filtration problems, for additional information. I hope that I have been helpful. Enjoy the pool season. ► Major Chlorine Vanishing Act? Hi, Alan. I appreciate your site and am hoping we can get some outside input into an incredibly unusual problem. We picked up servicing a 25,000 gallon, gunite, chlorine pool (non-salt). We are seeing rapid loss of chlorine in the pool. History of the pool has owners fighting an algae problem for close to a year. Algae continues to show up in spots of the gunite. At one time they had a high stabilizer level which they had been dropping over the months. They had been using a nylon brush to fight the algae. We had switched them to a wire brush which seem s to be more effective. A few times a year they have strong pollen in the air, enough to see it moving through the air. The pool does not have a screen enclosure. Sand filter has new sand, in a sand pool filter. The chlorine drops to zero in less than 24 hours. Chemistry of pool: CHL zero, pH 7.2, AKL 100, CAL 250, CYA 80, TDS 900, Copper 0, Iron 0, Phosphates 0-100 (trace). Here is the kicker, yesterday, per request, we added 24 lbs chlorine to this pool. Today, chlorine free and combined is at zero. So we know that something is literally burning the chlorine out of the pool, but what could it be and what can be done? What could cause 24 lbs chlorine to drop out of a 25,000 gallon pool in less thank 24 hours. Chlorine is 68% Calcium Hypochlorite. Thanks. So they have been battling algae for years! It would be safe to assume that they have not always been diligent about maintaining the free chlorine levels. Everyone looks for the silver bullet, but they are all gone. I suspect that in the quest to eliminate algae, they added a product containing sodium bromide. Once they added the sodium bromide, the pool became a bromine pool. This prevents the chlorine from being protected by the cyanuric acid, as the chlorine is used up converting the bromides to bromine. This would explain the high use up rates. However, given the magnitude of the problem, I suspect that this pool was once using bromine and for a few years minimum. These people may not be the original owners. The visible algae is only adding to the problem. You can test for sodium bromide, using LaMotte Test strips. They have to add enough chlorine to destroy the algae and provide an excess. They should be able maintain a level, although the application rates will still be high. The original problem may have involved a chlorine-resistant algae and adding the sodium bromide is a solution. Better to add more chlorine and solve the problem -- then add less and not solve anything. A sodium bromide test will confirm my theory. I hope that this will be helpful in finding a solution. Interesting take. Liking the sodium bromide idea. Salt, even though not a salt pool was measured at 1400. Thinking the salt is the byproduct of the chlorine disintegrating so quickly. Ammonia tested for zero and nitrates was 20 or under. Sodium Bromide test coming soon. Incredibly, on Thursday, 5 lbs of 68% cal hypo disappeared in 1hr 32min, in this 25,000 gallon pool with CYA at 80. It was absolutely amazing to watch. If there are bromides, the salt level is not relevant and the cyanuric acid will not function. Chlorine reacts with bromides to form bromine and the Sun destroys it, far quicker than if remained as chlorine. Let me know what happens, with the test. LaMotte has Sodium Bromine Test Strips, as part of their Insta-Test line. Hi, Alan. Got the results back from the pool with rapid chlorine loss form a few weeks back. 25,000 gallon gunite pool, chlorine drops out in hours. Sodium bromide tested at 1726ppm. WOW! Other than draining, any ideas how to reduce that kind of level? Thank you a bunch. Great insight into the problem. If the bromide level was 25 PPM, it would take a long time for all the chlorine to convert the bromides to bromine. When the level is 1726 PPM, it happens quickly. This pool must have been maintained on bromine for years. It is still a bromine pool. If you want it to be a chlorine pool, you need to pull the plug, as the replacement of all of the water is the only solution. Now you know why LaMotte makes Bromide Test strips. How to reduce Chlorine Consumption, with fewer problems. An Ultraviolet Sterilizer eliminates sanitizer -resistant microorganisms. A Floating, Solar UV Sanitizer can reduce chlorine additions, by 50% or more. Dual-Ion Mineralizer, uses copper/zinc ions. For all pools. UV can kill resistant microorganisms, reducing overall chemical usage. This Floating Solar UV Sanitizer can reduce chlorine usage, by 50% or more. The Pool Circulator eliminates dead zones and improves sanitizing. ► In-Line Chlorinator And Check Valve? I have an in-line chlorine feeder. Do I need to use a check valve if there is no heater? The purpose of the check valve is to protect the heater from corrosive backflow from the chlorinator. No heater, means a backflow valve is not required. This product helps keep the water warmer, by reducing evaporation. I hope that this answers the question. ► More Than Mellow Yellow? Hi Alan, Love your website, I couldn't really find an answer to my question, can you help me? We have had our new pool for 3 years (new home). We have a good filter system, etc. and the water has been fine, but recently the chlorine levels are really high. My husband added shock a few times, because a friend said that would help, but I actually think that is when the problem started. We only do the "visual" test, don't know how to do all the numbers. The color is bright orange, instead of mellow yellow. We turned off our chlorinator, and waited over a week, and it still is high. The pool gets very little use, just us, about once a month. Any suggestions? Thanks. Too much chlorine - plain and simple. The tester that you are using provides a poor picture of the state of the chlorine content. I suggest that you get a test strip such as the LaMotte Insta-Test. Better yet, order a ColorQ PRO 7 all-digital tester. Both measure free and total chlorine. The free chlorine should be 1-3 PPM and the total chlorine not more than 0.3 PPM higher, for ideal conditions. A water analysis will help determine what the next step should be. If the free chlorine is low, add more chlorine. If the total chlorine is more than 1 PPM, try adding some potassium monopersulfate shock. Hope that I have been helpful. ► Unstabilized Tablets And Reducing Cost? Can you tell me who makes/sells unstabilized chlorine in tablet or stick form. I generally use 3" pucks but they seem to only be available with stabilizer in my area (Tennessee). Some guy on a forum, which I can't find again, said he had started using unstabilized tablets because of stabilizer build up and that's what I need to do. I have used liquid bleach and it's good, but it has gotten as expensive as pool stuff and it's heavy. Thank. So far as I know, the only chlorine tablets, for residential home feeders, are stabilized trichlor tablets and sticks. It is dangerous to use any other form of chlorine, in an enclosed in-line feeder, as there is a risk of explosion or serious damage. Have you ever considered a salt chlorine generator? No chlorine to buy, store or handle. No buildup of stabilizer! I realize that you want to reduce your chlorine costs and that can be done by reducing consumption. The addition of a Solar-Powered Dual-Ion Purifier/Mineralizer and or an ozone generator will reduce the amount of chlorine, used during the course of the pool season. It can be used, no matter how the chlorine is added. I hope that this information is helpful. ► Why Test Total Chlorine? Found you site through the LaMotte website. I recently bought a Pool Manager DPD test kit (model DT-3, Code 7011). I am a new in ground pool owner in the south of France. I am OK with the pH test (5 drops of indicator) and the free Chlorine test (add tablet 1 to fresh water), but it is unclear whether the total chlorine tablet goes in the same water as the free chlorine test (i.e. sequential) or whether I need to get some fresh water from the pool. I am aiming for a target of 1.5 - 2.0 Free Chlorine and 7.4 pH, are there any limits for the Total Chlorine and why am I doing this test at all? Best regards. You should use the same water sample. The Free Chlorine test measures the active sanitizer. Total Chlorine is Free Chlorine plus Combined Chlorine. 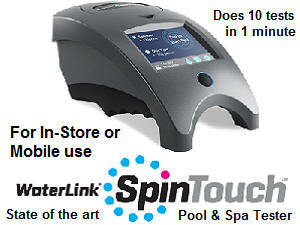 Ideally, you want the Total Chlorine reading to be less than 0.3 PPM higher than the Free Chlorine reading. Otherwise, a shock treatment may be necessary. Combined chlorines are irritating and odorous and you want to control their concentration. I hope this explanation helps. ► Chemical To Help Make Chlorine Last Longer In The Sun? Can you please tell me a chemical I can use to make chlorine last longer in the hot sun. Thanks. Chlorine stabilizer is what you need to help make chlorine last longer. Chemically, it is cyanuric acid. It is sold, most wherever pool chemicals are sold. In most cases 20-40 PPM is used. Chlorine depletion can also be due to algae growth, high bather use, urine, phosphates and nitrates. Poor circulation can make algae growth more likely. You might consider adding THE CIRCULATOR, because it will dramatically improve pool water circulation, as well as chemical and heat distribution. I hope that this information will prove helpful. Our pool has a salt water chlorinator. I don't actually add chlorine to my pool. We use test strips which indicate high Free Chlorine. Can you give some suggestions on what we should do to drop the chlorine level? You are producing too much chlorine for the pool, at least for this time of the year. Lower the setting on your salt chlorine generator or cut back on the hours of usage. Chlorine neutralizer products are available that can quickly lower very high levels. Otherwise, shut off the chlorine generator, until the level drops into a comfortable range. I hope that this information proves helpful. ► Dark Orange Test Color? We just opened our 24 foot round above ground pool. I did not check the chemicals before adding 2 gallons chlorine and 18oz of algaecide. Now, 24 hours later, when I check the chemicals, the chlorine reading is dark orange and pH is very dark red. What do I have too much or too little of? Sounds like you are using an OTO test kit. The dark orange color should indicate that the chlorine level is very high. If you just opened the pool, it will drop as the chlorine reacts with algae and debris. The very red color probably indicates that the pH is too high. Add pH reducer, in order to lower it into the 7.2-7.6 range. OTO test kits present a, somewhat, misleading picture of the state of the pool water chemistry. I suggest that you consider using a more modern product such as Insta-Test Test Strips. These test strips function well at high ranges and test for the more important Free Chlorine reading. OTO only test total chlorine. If you would like to avoid guess about color-matching, a ColorQ all-digital water analyzer is just what you need. I hope the information proves helpful. ► Why Does The Chlorine Level Drop? I’m using a salt water generator on a 34,000 gal indoor pool that I keep covered. I use the ColorQ test kit for all testing. I keep the pH at 7.2, The stabilizer is 68 ppm, so the alkalinity is 81 (alkalinity tests at 109 ppm), free chlorine at 2 to 3 ppm, total chlorine less than 2 ppm over the free chlorine. Recently, the chlorine is being used up at a rate of about 1 ppm per day, even if no one uses the pool. Why is the chlorine getting used up do fast? Thanks. Your combined chlorine (the difference between the free and total chlorine readings) is too high. Ideally it should be under 0.3 PPM - certainly under 1 PPM. In your case the reading could be 2 PPM. Each 1 PPM of combined chlorine will destroy 10 PPM of free chlorine, which is why the level is dropping. When the combined chlorine gets under 0.3 PPM, the free chlorine level should be more stable. In addition,, the filter contains organic matter, which was previously filtered out. As water passes through the filter, it reacts with this organic debris. There could be a little or a lot. When the filter is off, bacteria, in the filter are free to grow, creating a new demand for chlorine. When the filter and pipes are free from organic matter, the chlorine stability should increase. I hope that this information has been helpful. ► Chlorinator Not Working Right? I have a chlorinator unit located right beside the pool filter, with an access lid at the top. It has an open pvc pipe in the middle where water flows down the pipe and out into the pool. I can’t see where the water is being pumped or pushed into the unit. My problem is there doesn’t seem to be adequate water being pushed up into the unit to sufficiently erode the 3” chlorine tablets. The flow of water leaving the unit and going into the pool is slower than normal. Is there anything I can do to fix this? I use to keep 3-4 tablets in the unit and maintained chlorine/free chlorine levels at 3 and 3. Now, I put 6 or 7 tablets in and I can barely keep a 1 PPM level. No algae in the pool yet! Help! It sounds like the chlorinator has become clogged with scale deposits or product residues, although I can't be certain. I suggest that you refer to the troubleshooting guide that may be present on the manufacturer's website. Before attempting to clean this equipment, all chlorine must be removed. Good luck and I hope that this information proves helpful. Thanks for the quick response. You were right. The inlet line was clogged. We’ve fixed it and things are back to normal. I’ll definitely recommend your site to others! Thanks again! ► Chlorine: is it Free or Total? I am going to a fitness club to swim in San Diego area. I am unable to do any other exercise because of severe back problems. Every time I go home after a swim and dip in the hot tub, my skin burns and gets prickly hot and I can't get the smell of chlorine out of my sinuses for 2 days. I talked to the maintenance man who said the he keeps the pool at 3 PPM and the hot tub at 5 PPM with a pH of about 7-7.5. Is he keeping the chlorine levels too high, especially in the spa? I desperately need to get this resolved so I can continue my only form of exercise without developing a skin problem on top of my many other health problems. Thanks. There are two types of chlorine: free chlorine that is the active germicidal form and combined chlorine which can be od orous, irritating and ineffective. The combination of free and combined chlorine is total chlorine. Most often the free chlorine is maintained at 1.5-3 PPM and the total chlorine should not be more than 0.3 PPM higher than the free chlorine reading, for ideal conditions. There is no way for me to know if the operator is testing for free or total chlorine. I suggest that you ask some questions, as to what is actually being tested, being maintained and what the county health authorities require. Maintaining such a facility solely on chlorine is fast becoming a thing of the past. The U.S. Center for Disease Control (CDC) even suggest that the facility users bring their own test strips and do some detective work. Today, salt chlorinators, ozonators, uv sterilizers and other alternative sanitizers are becoming the rule, rather than the exception. Good luck and I hope that I have been of some help. ► Combined Chlorine In Tap Water? Is there a test that can be done to check for "Inorganic" vs. "Organic" combined chlorine. It is my understanding that some combined chlorine may be present, in the tap water, in the inorganic form. It is, also, my understanding that this "Inorganic Chlorine" cannot be broken down by superchlorination (10 x the combined chlorine level). Is this true, and if so is there another way it can be eliminated? Never been asked this before! It is true that there may be some combined chlorine present in some municipal water supplies: chloramine to be more precise. While chloramine is much less effective as a sanitizer, than is chlorine (hypochlorous acid), it is also unlikely to oxidize some simple organic contaminants into chlorinated hydrocarbons (chloroform for example). For this reason many water authorities use chloramine instead of chlorine. In any event, we are dealing with very low quantities, especially as compared to the concentrations found in a swimming pool. Chloramine can be destroyed by 10 times its concentration of chlorine. Your question centers on inorganic vs. organic and in that context there is a problem. An organic compound is defined as one that contains both carbon and hydrogen. Chloramine does not contain carbon and is not an organic compound. If you are trying to read something sinister into the presence of chloramine in your water supply, you are off the mark, as its presence is likely intentional. I hope that I have answered the question. What is the recommended chloramine level for a pool? Some say 1 ppm and some say less than 0.2ppm. My tap water is approx 0.5ppm or less , I am confused on this point. How much does it take to oxidize 1 ppm or the 0.2 ppm. I only oxidize with monopersulfate. You are taking things out of context. Some water systems are sanitizing with higher levels of chloramines, in order to prevent oxidation of unwanted waste products. Chlorine was converting them into hazardous byproducts, such as chloroform and chloramines do not. This has nothing to do with a swimming pool. The generally agreed upon standard for free chlorine is 1.5-3 PPM and the total chlorine should not be more than 0.3 PPM higher, for the most ideal conditions. That means 0.3 PPM of combined chlorine or chloramines is maximum. It can be easier said than done, but that is the goal. MPS helps destroy chloramines and generates free chlorine. To destroy 1 PPM of chloramine, you need 10 PPM of free chlorine. I always preferred the MPS. If you want this to be less of a problem get a salt chlorine generator. It destroys chloramines, as the water passes thru the cell. It is the future of chlorine, as it is chlorine without many of the problems. I hope that this information is helpful. ► Stabilized Chlorine And Indoor Pool? My name is Josh of Hampstead, MD. I am a lifeguard and certified pool operator at a local indoor pool and have a question for you. We recently switched our chlorine treatment from sodium hypochlorite (liquid chlorine) to sodium Dichloro-S-Triaznetrione (dichlor). And the other day read that you should not use this in indoor pools. The reading did not give a reason why and I have been searching the Internet, but cannot find an answer. Can you help me? Shouldn't, don't need to or can't! Provided that state laws do not prevent the use of stabilized chlorine in commercial pools, you c an certainly use sodium dichlor in an indoor pool. However, you are paying a premium price for a chlorine that is stabilized against UV light from the Sun. This is not an issue in a indoor pool. The better question would be, should I use sodium dichlor? And the answer is no! The use of sodium dichlor would cause the cyanuric acid level to rise steadily over time, forcing at least a partial replacement of the water on a regular basis. The advantage of dichlor is that it is essentially neutral and completely soluble. Liquid chlorine can be metered in continuously and provide more controllable sanitation. It will require the regular addition of acid to maintain the pH. It is by far and away the most popular chlorine for use in commercial pools. The new trend for chlorine is towards the Salt Chlorine Generator, which is ideally suited for commercial pools, because of its controllability. for I hope that this information will prove helpful. Hello, Alan. I have a 18' x 4' above ground vinyl pool. I have been given different advice from everybody about what type of chlorine I should use. Stabilized vs. Non-Stabilized! Some say that stabilized will "eat" away the vinyl. While others say that because I used non-stabilized is the reason why I had so many problems last year with high pH and mustard algae! I am confused on which is best. Can you please help? I don't want to go through all that again this year! Thanks. Stabilized chlorine will not "eat away" at vinyl liners. If you leave any kind of chlorine in prolonged contact will vinyl, it can affect the color or damage the surface. When you use the unstabilized products, the chlorine level spikes upward and slowly drops, due to bather action, debris and the Sun's UV rays, until you add more. In addition, unstabilized chlorine products are all high pH and will raise the pH each time they are added. High pH values, tend to make the chlorine less effective. The combination of high pH and depleted chlorine levels can lead to algae problems, such as you are describing. If you are using calcium hypochlorite, the hardness levels will build up, over time, and may result in cloudy water and/or scaling conditions. Stabilized chlorines fall into two categories: a quick dissolving, completely soluble and essentially pH neutral granular dichlor and the slow dissolving solid forms of trichlor. Trichlor is acidic and will require periodic adjustment of the pH. The advantage is that this product can be used in a feeder, providing a more consistent application of chlorine to the pool. This, in turn, helps to reduce the probability of algae growth and makes for more comfortable swimming conditions. Stabilized chlorines are protected against UV destruction and tend to last longer than unstabilized types. The best defense against mustard algae is maintain a consistent free chlorine level, of 1.5-3 PPM, and use an effective algaecide, as additional protection. I hope that I have answered your questions and provided some assistance. Enjoy the pool season. Is there more cyanuric acid in sodium dichlor shock treatment than in trichlor tablets? What is and where do I get non-chlorine shock and lithium hypochlorite? What do you mean when you say "standard chlorine treatment is declining." And one last question, what are and why are the support products for a "salt chlorine generator" different? Thanks for all the good info on your site. Yes, there is more cyanuric acid in a pound of dichlor than in a pound of trichlor tablets. Both are chlorinated cyanuric acid. Trichlor contains more chlorine, so that leaves less cyanuric acid. Both products will cause the cyanuric acid to rise, as they are added over time. Potassium monopersulfate is non-chlorine shock and should be widely available. Lithium hypochlorite is included in many lines of chemicals and should be easy to find. The popularity of regular chlorine is declining, as products like salt chlorine generators continue to grow. It is still chlorine but without the storage, handling and additions. And no fear about cyanuric acid build up. Apart from the on time addition of salt, the chemicals are the same as for any chlorine pool. I hope that this helps clarify the subject. ► Lowering Pool Chlorine Level? The chlorine level in my pool is through the roof and I can't figure out how to lower it, I have heard that I should use muriatic acid to lower the level? If that's true how should I go about it? Thank you for your help. It is not true! It will make the chlorine more aggressive and could fade the liner. Keep the pH at 7.2-7.6. Lowering the level is simple. All you have to do is add a chlorine neutralizer product, as directed. It will work quickly. In the future remember that you can always add more chlorine - you can't take out. Good luck and I hope that I have been helpful. ► Are The Tablets Still Good? I have some 3" chlorine tablets that I bought in bulk that are about a year old. Are they still good? Also I live in Houston, TX where it get very hot (95 - 100 degrees) in the summer and my pool is exposed to the western sun. I had problem maintaining a chlorine level of 1-3 as recommended. The chlorine seem to evaporate from the water in a day due to the temperature. I have a 22,000 gallon gunite pool and the chlorinator dissolves my chlorine tablets at about a rate of 7-8 tablets a week. Any thoughts on that matter. Thanks. It is possible that the chlorine has lost some of its strength over time. Short of a chemical analysis, there is no way to be sure. Your apparently high chlorine consumption could be related to the biological demands of the water, the high temperatures, sun exposure and possibly the pool water chemistry. It may have nothing to do with the content of the tablets. I suggest that you shock the pool to eliminate any pent-up chlorine demand and start with a level playing field. Unless the tablets are in a state of obvious deterioration, I would certainly use up the tablets. In the unlikely event that their potency is reduced, you should add an extra tablet, monitor the chlorine readings and adjust the chlorinator accordingly. I hope that I have been helpful. Alan, is there such a thing as over chlorinating a pool? Is it possible that I added too much shock? My pool is extremely cloudy and I have been trying to shock it and it does not seem to be working. the filter has been running for four days now, and still cloudy. I have backwashed it, added clearing chemical, and vacuumed it twice. Is it possible I have a chlorine block going on? If so, how do I treat it? Thank You. Chlorine block is one of those swimming pool water problem areas riddled with myth and misinformation. If the pool has been over chlorinated, the test readings should be very high. The catch is that very high chlorine levels can destroy the testing chemicals and give false results. The best method to use to test for high chlorine levels is Syringaldazine: the chemical used in test strips such as the Insta-Test products. Do you have high chlorine levels? My guess is that you do not. I suggest that you confirm what your free chlorine level is and if it is below 5 PPM, you should add more shock. It sounds like you have a sand filter and this type of filter can be less effective after backwashing. Inadequate filtration is probably part or all of the cause of the cloudy pool water. Boost the free chlorine level to 10 PPM and add 1/2 pound of DE to the skimmer with the filter operating. Make sure that the pH is 7.2-7.6 and keep the filter running. The next day add a dose of a quality blue clarifier, to help coagulate fine, suspended particles. Consider adding a Nano-Stick Clarifier, which lasts up to 4-6 months, for ongoing improvement of the water clarity and quality. Once the water is clear, backwash to waste and reapply the DE. Thereafter, backwash only when the pressure is too high. The efficiency of a sand filter can be greatly improved by the use of a zeolite sand replacement filter media. It is convenient, longer-lasting and modestly priced. Something to consider, whenever the filter sand is replaced? A salt chlorine generator would be a better way to do chlorine! I hope that this information will prove helpful. Alan I am ready to throw in the towel. I have a approx 24,000 gal. inground pool. I just had a new pool liner put in and I used my well to fill up the pool. I can not keep a chlorine reading for more than 2 days. I have add chlorine stabilizer though I'm not sure I added enough. I keep getting algae growth on a continuous bases. The pH is within limits and so is the TA. I have to shock the pool ever 3 days to keep a reading at all and it drops fast. I also keep chlorine tablets in the skimmer this does not help either. This is getting expensive. Another question how do I test for calcium hardness I have never done this. Starting from scratch with new (well) water what are all the chemicals I have to add for the water to be correct. Maybe I missed something? Any information would be a life saver. Thanks. Not having enough stabilizer is not the problem! Your pool has algae and you are not going to be able to maintain a Free Chlorine level, that is adequate, without destroying all of the algae. To do this you must add a quick dissolving chlorine or shock, every few hours, until the algae is gone and you are able to maintain a 1.5-3 PPM Free Chlorine level, after an overnight period. Keep the filter running and try to redirect the returns to send more water towards the problem areas. Your well water could contain materials that consume chlorine or add to the problem. If possible. have the water tested for phosphates and nitrates. Both are possible, if the well is from an agricultural area. ColorQ electronic testers available that test for calcium hardness, as well as other pool water parameters. I would suggest that you add a quality mineral treatment, such as Liquid MetalTrap, as soon as possible, because well water can contain metals that can color the water and stain underwater surfaces. The best option would have been to use a MetalTrap Filter to remove all metals, as the pool was being filled. Nothing beats keeping metals out. It simply attaches to a garden hose and can be used, with a small submersible pump, to recirculate the pool water. As water passes through, the metals will get removed. Refer to the archives on pool shocking, pool water testing and algae for additional information. I hope that I have been helpful. ► Needing A Bit More Chlorine? I have an automatic chlorinator and it doesn't always seem to provide enough chlorine. I have opened the settings all the way. A few times the water started to cloud. Any advice will be helpful. Try and keep the chlorinator filled with the tablets. Don't wait for them to dissolve half way or more. The more chlorine in the chlorinator - the more that will dissolve. Try shocking the pool every Sunday evening. The weekend is usually the most active period and the shock treatment will help re-establish the Free Chlorine level. That way the chlorinator does not have to play catch up. These suggestions should help, just make sure that you test for Free Chlorine regularly and often. Enjoy the summer. ► Wanting To Protect The Liner? Just found your website. There is a lot of good information here. I just had a new liner installed (inground, 16'x32'). I want the liner to last as long as possible. I have Pool Cleaning Granules that I use to shock the pool (I use the Trichlor tabs in the feeder). Even when I broadcast the granules, they end up on the pool bottom. I am worried that this will damage the liner. I would like to add the granules to a five gallon bucket of pool water, mix well, and pour into the skimmer. I have been told not to do this. But, I cannot find out why I should not do this. Can I do this? What are the pros and cons? My present readings are: Free and total Chlorine are 2.5ppm, Temp is 80°F, Total Alkalinity is 110 ppm, pH is 7.5, Calcium Hardness is 260 and Stabilizer is 45 ppm. Thanks. Chlorine should always be added in full accordance of the label directions. Adding chlorine through the skimmer is not some thing that filter manufacturers recommend or that I would ever suggest. I assume that the product that you are referring to contains sodium dichlor. Dissolving this product in a bucket of water could prove dangerous and that is the reason it is and should used in that manner. This product is normally broadcast into the pool and is relatively quick dissolving. Your concern about the liner is well founded. Avoiding chlorine contact with the vinyl liner is a good practice. Because you are using trichlor tablets, in a feeder, I suggest that you use a product other than dichlor, as a shock treatment. Otherwise the stabilizer level will rise too rapidly, possibly requiring some water replacement. This can be done by using liquid chlorine or a non-chlorine shock, whenever a shock treatment is required. Avoid ultra high free chlorine levels, especially coupled with low pH conditions. A salt chlorine generator is a better way to add controllable amount of chlorine, which helps preserve the liner's appearance. I hope that this information is helpful. ► How To Neutralize Chlorine? Our pool building experience has been unpleasant at best. The contractor finally "finished" the pool last weekend. They plastered and filled it, and we were reasonably pleased, but woke the next morning to half a dozen serious cracks in it. Now after arguing with us, and putting chlorine into it, they have agreed to drain and redo it. However, they would like to pump the water into a runoff canal on the property, but we are refusing because we are concerned about putting chlorinated water into it. Is there a way to neutralize the chlorine so that it can be pumped it into the canal or do we have to insist that water trucks remove it? Thanks for your help. Sincerely. Most pool dealers carry a chlorine neutralizer product. Used as directed, it will drop the chlorine level very quickly. The products, of its reaction with chlorine, are harmless. I hope that this information is helpful. ► What Is Stabilized Chlorine? Can you explain to me what stabilized chlorine is and what are the advantages and disadvantages? Right now I am using calcium hypochlorite and I'd like to switch. Thanks. Stabilized chlorine refers to products that help protect chlorine, in the water, from being destroyed by ultra-violet rays from the Sun. This ability will help the chlorine last longer and save on consumption of chlorine. Stabilized chlorines are essentially chlorinated cyanuric acid. It is the cyanuric acid portion that acts as a stabilizer or conditioner and improves the performance of these types of chlorine. Stabilized chlorine is available in two types. Sodium dichlor is a granular material, completely soluble, quick dissolving, essentially pH neutral and is used for daily chlorination and shock treatment. Sodium dichlor cannot be used in an enclosed chlorinator. Trichlor is usually available in a solid form, tablets or sticks, and is a slow-dissolving product, that is used in chlorinators and floating feeders. A granular form of trichlor is available for spot treatment of masonry pools only - not for use in vinyl pools! Trichlor is acidic in nature and its use may lower the pH over time. Stabilized chlorines offer versatility and convenience. The only disadvantage is that the stabilizer level can build up over time and can require some replacement of pool water. If you want to avoid the inevitable buildup and water replacement problems, a salt chlorine generator would be the ideal solution. Affordable and controllable! I hope that I have been helpful. Enjoy the summer. ► Various Names For Chlorine? Everything I read has a different name for chlorine and it's confusing. Free chlorine? Is that something that you don't have to pay for? Just kidding, but you can get the drift? Could you explain the differences in really simple terms. Thanks. Free Chlorine is the active germicidal form of chlorine and chemically known as hypochlorous acid. Also called Available Chlorine. This is the good stuff, as far as sanitizing is concerned. Combined Chlorines are the products formed when Free Chlorine reacts with waste materials and forms Chloramines and other Combined Chlorines. These forms can cause odor problems and are irritating and ineffective pool water sanitizers. Total Chlorine is the sum of the Free Chlorine plus the Combined Chlorine. This value includes all the forms of chlorine. Sometimes, called Chlorine Residual. This is not a meaningful indicator of the sanitizer level, because you never know how much is Free Chlorine. Chloramines are irritating, odorous forms of combined chlorine, formed by the reaction of chlorine with nitrogen containing waste products. Ineffective as a pool or spa sanitizer. High levels of chloramines can cause the problems of "Red Eyes" or Stinging Eyes." Usually requires a shock treatment to lower or destroy. If you are only going to perform one test, do the Free Chlorine Test. In ideal swimming pool water, the Total Chlorine reading should not be more than 0.3 PPM higher than the Free Chlorine reading. That can be difficult in the real world, so be prepared for occasionally higher differences. I tried to keep it simple. Hope I succeeded! ► Should I Dissolve The Chlorine? I have been dissolving granular chlorine in a plastic bucket before adding to the pool. Is that a good practice? My friends say no. Please settle the question for us. Thank you. I'll side with your friends! What you are doing, depending upon the type of chlorine used, could be quite dangerous. Please read the labels and follow the directions. Please! A friend of mine had a beautiful looking above ground pool, just a few years ago. Now the liner looks all bleached out. He adds a granular chlorine to the pool and just dumps it into the water. I'm not sure, but I think the chlorine is the problem. Can that be? I am doing some research now because I plan on getting a pool next spring and I would like to maintain the appearance. Thanks. It is normal for a vinyl liner to lose some of the color over a long period of time. Ideally, it happens on an even, overall basis and not in blotches. Vinyl liners can last for 10-20 years, depending upon vinyl quality and conditions, before needing a replacement. The practice of "dumping" chlo rine into the pool is not helping to preserve the liner's appearance. Granular chlorine should be broadcast across the surface, to allow for a more gentle addition to the water. This will avoid clumping on the bottom, which could result in some bleaching. Chemicals should be added with the filter operating. If there is an automatic pool cleaner, it can help avoid products remaining on the bottom, by improving circulation across the depths of the pool. Typically, lithium hypochlorite and sodium dichlor are added to the pool by broadcasting. Calcium hypochlorite is usually added by forming a slurry and decanting the clear liquid into the pool: away from the walls and in front of a return flow. Always use all chlorine products in full accordance with the label instructions! Built-in chlorinators, that use solid forms of Trichlor are very popular and help avoid liner fading, by applying a more uniform concentration of chlorine over a period of time. Salt Chlorinators avoid the need to add any chlorine at all. The chlorine is made right in the pool and it can maintain a much more consistent level - something that's good for a vinyl liner. Or you could add an Ozone Generator or an Ultraviolet Sterilizer and it can drastically reduce the amount of chlorine that you will have to add and the liner will look all the better! Good luck with the pool. I hope that I have been helpful. Gas chlorine seems to getting more popular. You don't have to handle any chlorine and the price is right. Any thoughts on this topic? I don't like any method that adds all the chlorine, at one time. Gas chlorine certainly can be effective and does not contribute byproducts, but there is a downside, in my opinion. The chlorine level spikes upward, because of how it is added, and that can compromise bather comfort and bleach bathing suits. In the case of vinyl pools, the color of the vinyl liner could fade at an accelerated rate. I am a believer in the type of prolonged or slower-release chlorination that can be obtained by using an automatic chlorinator or a salt chlorine generator. These methods are better at keeping the Chlorine level within the 1-3 PPM range, that is so important for comfortable and worry-free enjoyment of the pool. I hope that I have been helpful. We had an 18X36 vinyl inground pool installed this season. I have been using the "hockey puck" tablets in the skimmer. I was familiar with the method because of how my parents maintained their pool. A friend mentioned, that this is not a good method, and suggested that I get a chlorinator. Is that the case? Thank you. It does sound like a case of like father like son! There are a host of reasons that you should not be following this practice. Some filter manufacturers will frown on this chlorination method. If you have a heater, it can lead to heater damage. At the very least you are exposing your vinyl liner to fading. Picture this: after the pump shuts off the chlorine tablets continue their slow dissolution and raise the chlorine level in the skimmer. Convection and currents can carry this higher chlorine content water out of the skimmer and into contact with the liner. Given enough time, there can be a degree of liner fading, especially in the areas surrounding the skimmer containing the chlorine tablets. If you add an automatic chlorinator, I'm sure that you will find that your use of chlorine will decrease because it is not being consumed in your filter and that you will have more control over the chlorine level. And of course your vinyl liner's appearance may be saved. Browse through the archives for more information on chlorine, filters, heaters and liners. I hope that I have been helpful and convincing. I have an in ground vinyl pool, 16 by 32 with a 6' deep end. I see all sorts of fancy devices for sanitizing. I use 1" trichlor tablets in floating feeder and shock the pool weekly. It all seems to work for me. What am I missing? I suspect that you are someone that is taking the time to do all the maintenance. Obviously you are doing a good job. Unfortunately there are lots of pool owners that don't spend the time to test the water, add the chemicals, vacuum the bottom and clean the filter. Basically, you ar e satisfying the pools requirement for chlorine. However, there are a few limitations. The floater gives your less control over the rate of chlorine additions and probably makes monitoring more frequent. But, these are things that you can work to control. However, there is something that you cannot correct and that is the floater itself. The floater remains in the water at all times and can be carried by currents or winds to positions behind pool ladders or into corners. Here it can remain in prolonged contact with the liner's surface and this can result in a bleaching of the vinyl liner. Using a floating chlorinator in a vinyl pool can entail a risk of bleaching and can be avoided by using an inline chlorinator. The inline chlorinator makes chlorine additions simpler, more controllable, helps avoid liner damage and takes the chlorine floater out of the pool and away from the bathers and that is a good thing! Most new pools are using salt chlorine generators, because they reduce the time and effort and produce better results, while avoiding buildup problems. You can dial the chlorine production up or down. You can use a convenient Salt PockeTester to measure the salt level, to make sure that it is within the manufacturer's suggested range. Add some acid, as needed, to lower the pH and you're good to go. Enjoy the summer.